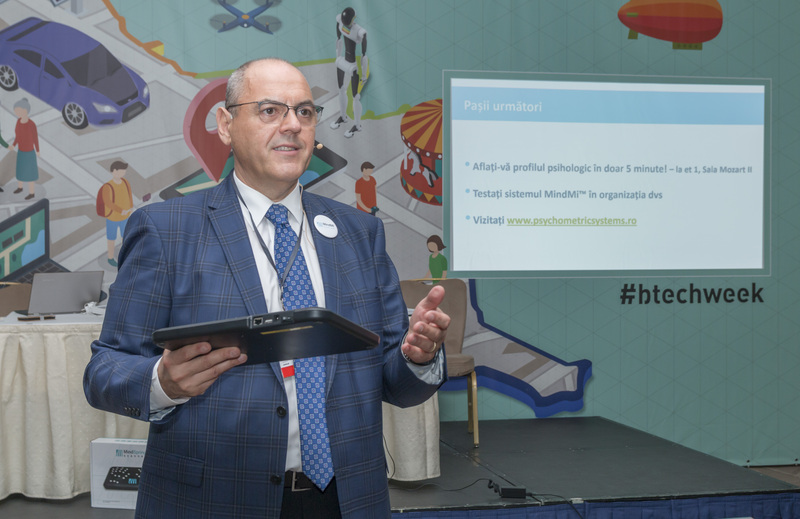 On the 25th of May 2016, during the Bucharest Technology Week, the MindMi™ System concept official launching and presentation took place. The product concept was introduced to as special workshop session, held in front of HR specialists and psychologists. With this occasion, the invited HR specialist and psychologists had the opportunity to test the product and to discover a psychological assessment system that provides unbiased data, easy to use on a web application. The examinations made with the MindMi™ system are non-invasive and imply placing both hands on the MindSpring™ scanner for 5 minutes. With the MindDeck™ web application, the MindMi™ System generates a psychological report in less than 1 minute, while all the collected data remain available in cloud. MindMi™ System can be used in multiple areas of applied psychology, but it is recommended to use more than one source of information before running a MindMi™ scan. It is beneficial to consider other data about the examinee, from an interview, psychological test, or practical tasks, and combine it with domain-specific knowledge. This can help when choosing what reports to use. MindMi™ technology facilitates more comprehensive data gathering and it can help people to make better decisions in recruitment, management or human resources. Information provided by the MindMi™ System does not treat or diagnose.